7 nights Overwater Bungalow accommodation. Enjoy 3 nights at Le Taha'a Island Resort & Spa, a member of the prestigious Relais & Chateaux association. 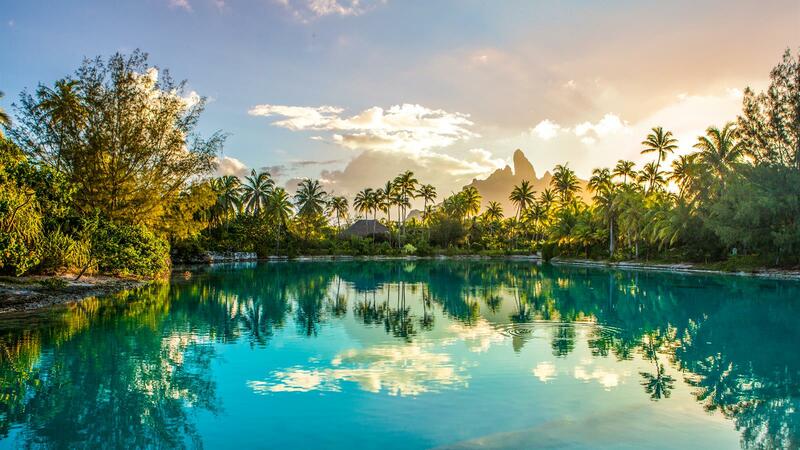 Located on a coral reef, the resort offers an unsurpassed view of the island of Bora Bora. Then 4 nights on Bora Bora: the “Romantic Island”. Choose from 4 deluxe resorts: the Intercontinental Resort & Thalasso Spa Bora Bora, the Four Seasons Bora Bora and the St. Regis Resort Bora Bora with Full Breakfast daily, a Tahitian Black Pearl for the Bride, VIP Status including a Welcome Letter from the General Manager, Chef's special Treats in your bungalow on arrival and a 5000 XPF Resort Credit to use during your stay at Le Taha'a and special Hotel Honeymoon Bonuses such as Champagne or Tropical Flowers. International and Inter-Island Airfare round trip and Airport Transfers included. , otherwise supplements will apply. Seats are limited and may not be available on all flights. Must be booked at least 120 days prior to departure. Black-out dates, minimum stay requirements, seasonal surcharges, currency exchange fluctuations, and other restrictions may apply. Government-imposed taxes and fees and carrier-imposed charges are included. Prices may differ when you book your travel and are not guaranteed until full payment is received. All prices are in US dollars and correct at time of posting. All prices, itineraries and routings are subject to change. City tax of approx. $2.00 per person, per night is not included.